Daily Illuminator: The Best Catalog Of The Season? December 19, 2015: The Best Catalog Of The Season? Forget fruitcakes or dog sweaters; here's a catalog that'll really get your motor running. The beloved Uncle Albert's Catalog from Hell -- for Car Wars Classic -- is available to download -- over 200 pages with all the goodies from the Car Wars Compendium, Boat Wars, Aeroduel, and much more. It also has other neat stuff, including upgrades from ADQ and earlier Uncle Albert's Catalogs, advanced jumping rules, and more fun stuff. Don't settle for the catalogs that clutter up your mailbox; get the catalog you'll really love. 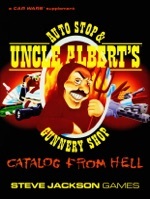 Uncle Albert's Catalog from Hell -- it's the gift that keeps on giving!